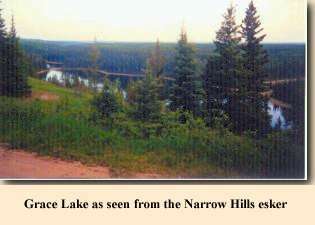 The whole area is forested, and at 53,610 hectares in area (250 square miles), Narrow Hills Provincial Park is among the larger parks in the province. 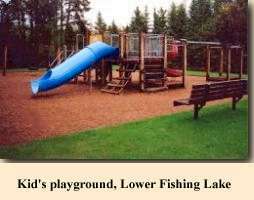 North of the flat farm land by 40 miles and south of the rocky Canadian Shield by 60 miles, the park was established in the 1930's and was known as Nipawin Provincial Park until a few years ago. 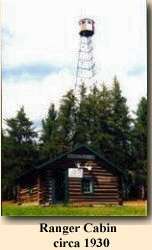 The forest is a mixture of spruce and pine trees with stands of poplar, birch, tamarack, and willow. The forest floor is sandy and very fragile, and grows many varieties of plants, shrubs and bushes, including cranberries, strawberries, raspberries, saskatoonberries, and the incomparable Saskatchewan blueberries. If you were under the impression that all of Saskatchewan is the same, get ready for a real eye-opener. This country is far from flat. It consists of rolling rough terrain that would test the best hiker. There are several great sites to see it from, with the most renowned and breathtakingly spectacular being the Narrow Hills Esker, a glacier-formed ridge with good access that will make you feel that you can see forever. More than a half-dozen hiking and cross-country ski trails begin here, ranging in length from a very short jaunt down to Grace Lake, to a 40 to 50 km trek to the village of Love. 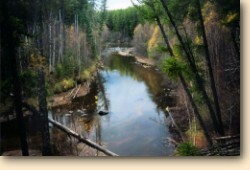 The area has lakes, rivers, and creeks a-plenty. Get your feet wet on a hot day as you sit on a rock in a creek, or hop right in. These waters are crystal clear and clean. Look into 6 meters at the sand bottom. Lots of crayfish and clams make exploring fun (for kids of all ages) while they're netting minnows. But don't just look under water. We have many varieties of birds that nest this area. There is nothing quite like sitting around the campfire* in the evening and listening to the haunting, magical sound of the loon; morning may bring the sight of an eagle catching a meal on the lake; and dinnertime will bring gray jays (whiskeyjacks!) to share your picnic lunch. There's always a squirrel to share your morning toast with. You might be lucky enough to see a bear, or unlucky enough to have your sneaker stolen by a sly nocturnal fox, and chances are good you will see deer, moose or caribou. Whether you're a serious photographer or just an observer, the area certainly presents opportunity (click here for slideshow). It's up to you to preserve the moment. We invite the eco-tourist; the more people that visit areas like this, the better chance we have of preserving what nature has provided. So if traffic and pavement and overcrowding have gotten the best of you . . . The area has many trails for hiking and biking with varying degrees of difficulty. They are great for pleasant walks or challenging hikes, whatever your choice. The smell of the forest in this fresh unpolluted air will relax you, which is exactly why many come here. Sit around your campfire* in the evening and tell stories. The loons provide the music and the occasional howl of a wolf can send a shiver down your spine. And likely morning will bring the chatter of a squirrel. *Campfires are allowed under normal conditions. Firewood is provided and obtained from past forest fire burn areas. Safety along with protection of the environment are high priorities. Lower Fishing Lake is approximately 2 kilometers wide by 3 kilometers long - excellent for swimming, as the beautiful natural sand beach stretches out into the lake gradually, with no sharp drop off. The large buoyed area keeps the area for swimming only. Play some beach volleyball, build some sandcastles or just soak up some sun while you lay in the sand. 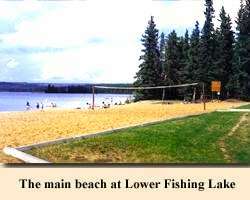 Lower Fishing Lake has an excellent boat launch that will accommodate larger units for waterskiing or tubing. There are miles of shoreline for picking up and dropping off skiers. And if your pleasure is canoeing then this is a perfect area. 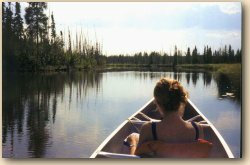 Surrounding Lower Fishing Lake, there are many, many other lakes ( within 15 minutes ) that are a dream for those who paddle. 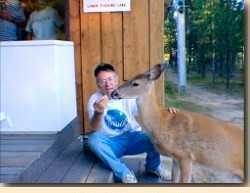 Send a postcard from Pine Ridge Resort!